A sweeping reshuffle by Poland’s new prime minister has changed the shape and direction of its government, with a greater emphasis being placed on economic modernisation, political stabilisation and improving EU relations. But as Aleks Szczerbiak writes, this pivot to the technocratic centre risks alienating the ruling party’s core electorate, and is more about packaging the government’s reforms attractively than abandoning its radical state re-construction programme. In January, Mateusz Morawiecki – who, in a surprise move, replaced Beata Szydło as Poland’s prime minister – ended months of speculation by announcing a sweeping reshuffle of the Polish government which, since autumn 2015, has been led by the right-wing Law and Justice (PiS) party. The most symptomatic change involved the replacement of defence minister Antoni Macierewicz, a powerful figure who enjoys the backing of the ruling party’s radical wing, by interior minister Mariusz Błaszczak. Before he took on the defence portfolio, Mr Macierewicz headed up a party commission investigating the causes of the 2010 Smolensk tragedy in which the then Law and Justice-backed President Lech Kaczyński, twin brother of party leader Jarosław Kaczyński, and dozens of other senior officials died in a plane crash in Western Russia. The Smolensk issue was a touchstone for the party’s core supporters and viewed as part of a broader pattern of betrayal of the country’s interests by the liberal-centrist Civic Platform (PO), Poland’s ruling party between 2007 and 2015 and currently the main opposition grouping. However, Mr Macierewicz’s commission caused controversy by appearing to countenance sabotage as a possible cause, but failed to find conclusive evidence of this even when it became an official state body after Law and Justice’s 2015 election victory. As defence minister, he also clashed repeatedly with Law and Justice-backed President Andrzej Duda who, according to the Polish Constitution, is commander-in-chief of the armed forces. Moreover, Jarosław Kaczyński – who does not hold any formal state positions but exercises a powerful behind-the-scenes influence in determining the government’s programmatic and strategic priorities, and is always sensitive to potential challengers – became concerned that Mr Macierewicz was using the ministry to develop an independent political power base. Some commentators also suggested that pressure from the US State Department played a decisive role in Mr Macierewicz’s sacking. Other high profile dismissals included foreign minister Witold Waszczykowski, who was often embroiled in disputes with the EU political establishment and replaced by his less controversial deputy Jacek Czaputowicz. Council of Ministers standing committee chairman Henryk Kowalczyk replaced environment minister Jan Szyszko, who had attracted widespread criticism over his moves to allow logging in the Białowieża primeval forest. Cardiologist and deputy higher education minister Łukasz Szumowski took over as health minister from Konstanty Radziwiłł, who failed to resolve a high profile dispute involving resident doctors. At the same time, Mr Morawiecki appointed his former deputies to lead the key ministries that he had headed up before becoming prime minister: Teresa Czerwińska as finance minister, Jerzy Kwieciński as investment and development minister, and Jadwiga Emilewicz in the entrepreneurship and technology brief. All of these were centrist, technocratic figures not associated with front line party politics; although Mr Morawiecki also re-appointed justice minister Zbigniew Ziobro, who oversaw the government’s controversial judicial reforms. Mr Morawiecki only became a Law and Justice member in March 2016 and lacked a power base in the ruling party’s factional politics, raising doubts as to whether he would be able to resolve the government’s main structural weakness: infighting between ministers entrenched in their departmental power bases. However, the fact he appeared to be given a free-hand to stamp his authority on the government and dismiss such powerful figures as Mr Macierewicz suggests that the new prime minister has much greater room for manoeuvre then his predecessor. Mr Morawiecki clearly enjoys Mr Kaczyński’s trust and there is even speculation that the Law and Justice leader is grooming him as his long-term successor. Nonetheless, Mr Kaczyński remains a key figure in settling personnel and policy disagreements within the governing camp and ensured that two of his most trusted allies, Mr Błaszczak and party organisation supremo Joachim Brudziński, were appointed to head up the key defence and interior ministries. Another important consequence of the reshuffle, especially Mr Macierewicz‘s dismissal, was to strengthen Mr Duda’s position and defuse the row between the President and the ruling party which, at one time, appeared to threaten the unity of the governing camp. Relations between Mr Duda and the Law and Justice leadership became very tense after the President’s dramatic and surprising decision last July to veto two of the government’s flagship judicial reform laws, as part of an effort to assert his independence and autonomy. However, rather than embarking upon a confrontational course, Mr Kaczyński decided to try and mend relations with the President and conceded a certain amount of influence to him over policy and appointments. Improving relations with Mr Duda would have been impossible beyond a certain point if Mr Macierewicz had remained in office and Mr Kaczyński was clearly willing to risk alienating certain elements of Law and Justice’s political base in order to strengthen the governing camp’s internal cohesion. One of the reshuffle’s main objectives was to stabilise and consolidate Law and Justice’s position ahead of a series of key elections: local government elections in autumn 2018, European Parliament elections in summer 2019, and parliamentary elections in autumn 2019, culminating in the summer 2020 presidential poll. Since it was elected in 2015, the government has undertaken a series of controversial reforms, notably of the judiciary, civil service and public broadcasting. These have laid the groundwork for a radical reconstruction of the Polish state but also precipitated large-scale anti-government protests and led to opposition accusations of creeping authoritarianism (which the government vigorously denies), as well as bringing the ruling party into conflict with the country’s legal establishment and cultural elites. Beata Szydło’s administration took the political flak for introducing these reforms but, with the passage of the judicial reform laws at the end of last year, many of the key elements of the government’s state re-construction programme are now in place. Mr Morawiecki is, therefore, hoping to shift the focus of debate in the second half of the government’s parliamentary term away from these controversial issues by portraying his administration as a team of technocratic experts governing efficiently, modernising an increasingly prosperous and secure country, and ensuring that ordinary Poles share in the benefits of economic growth. The reshuffle is thus an attempt to broaden Law and Justice’s appeal to more centrist, less politically committed Poles who do not reject the ruling party outright but mistrust figures such as Mr Macierewicz; as well as encouraging the country’s elites to come to terms with the government. Indeed, some commentators have suggested that the reshuffle may be part of a more ambitious, long-term project of transforming Law and Justice into a pragmatic conservative grouping; although others dismiss it as simply a tactical pivot similar to the one that the party performed so successfully in the run-up to the 2015 elections. Part of the motivation for the reshuffle was also to improve relations with the EU political establishment. Law and Justice has found itself in conflict with the EU institutions and major European powers on several fronts. It refuses to implement an EU plan for the compulsory relocation of Middle Eastern and North African migrants, which it argues would force multi-culturalism upon Poland and threaten its national security. It disputed a European Court of Justice order to stop logging in the Białowieża Forest, arguing that it was only removing trees on public safety grounds. In December, Poland also became the first EU state to have a so-called Article 7 procedure launched against it following criticisms from the European Commission that a dispute over appointments to and the functioning of the country’s constitutional tribunal, and the government’s judicial reform programme, posed a threat to the rule of law; a charge that Law and Justice vigorously denies. For many commentators, Mr Waszczykowski and Mr Szyszko symbolised the government’s poor relations with the Commission and their dismissal was prompted by a desire to give the government a more EU-friendly image. However, Law and Justice’s change of strategy also carries risks. While the government has enjoyed the fruits of strong growth and low unemployment, it also needs to deliver on its ambitious investment and modernisation agenda, while an economic downturn would make it difficult to finance the very costly social spending programmes that have been crucial to its continued popularity. It may also prove impossible to avoid divisive political conflicts. For example, the Polish parliament is currently debating a civic initiative to further tighten the abortion law. Most Law and Justice deputies support this, but in autumn 2016 large protests forced the ruling party to vote down a previous attempt to introduce greater restrictions. 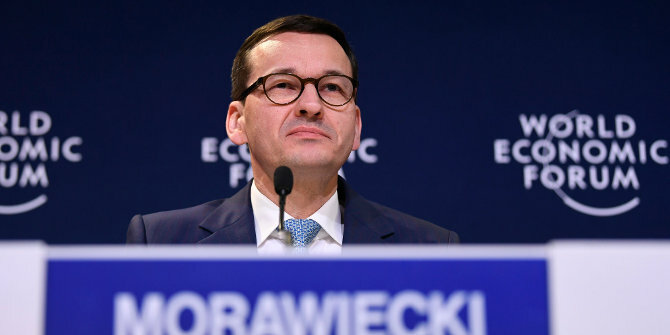 Moreover, while Mr Morawiecki indicated that Warsaw is open to negotiations with the Commission, he has also made it clear that his government will not abandon, or even significantly modify, its judicial reforms, nor its opposition to compulsory migrant relocation. Two important tests for the Morawiecki administration will be: whether Poland can find six countries prepared to block the Article 7 procedure at the first stage of voting in the Council of Ministers (probably at the end of February); and if the new EU budget, negotiations on which begin later this year, will link disbursal of funds to the functioning of a member state’s judiciary. More broadly, there is a risk that Law and Justice’s pivot to the centre could alienate a section of its core electorate and supporting media, notably the milieu clustered around the Catholic ‘Radio Maryja’ broadcaster which is very influential among Poland’s ‘religious right’. Many of the party grassroots were already disorientated by the fact that the popular and folksy Szydło was replaced by Morawiecki, a technocratic former bank chief executive. However, with its support at record levels, Law and Justice is counting on the fact that Macierewicz and the Radio Maryja milieu will reject the idea of a right-wing breakaway party as politically suicidal. Moreover, even if they do not always understand the rationale underpinning his political manoeuvres, the great bulk of the party’s core supporters still trust Mr Kaczyński’s instincts and see his continued leadership of the governing camp as the best guarantee of its right-wing bona fides. Mr Morawiecki’s radical reshuffle has significantly changed the shape and direction of the Law and Justice government, with a much greater emphasis on economic modernisation and political stabilisation both domestically and internationally. The party’s apparent pivot to the moderate technocratic centre has also made it more difficult for the weak and divided opposition to develop an effective strategic response and sustain its narrative that a divisive and illiberal government is isolating Poland. At the same time, while Mr Morawiecki clearly has a different governing style from his predecessor, the new administration appears just as committed to pursuing the core elements of Law and Justice’s programme of so-called ‘good change’ (dobra zmiana). The adjustment has so far been more about softening the government’s image and presenting its reforms more attractively rather than any substantive policy change.